The rumors are true, Samuel L. Jackson is all set to reprise his role as Nick Fury in the upcoming Captain Marvel movie. Nick Fury helped form the original Avengers team and he has made numerous appearances in the MCU since his first sighting in 2008's Iron Man. Jackson will also participate in Avengers: Infinity War and the untitled sequel in addition to popping up in Captain Marvel, which is set to open in 2019. The last time we saw Nick Fury on screen was for Avengers: Age of Ultron and before that we saw him get shot and hospitalized in Captain America: Winter Soldier. 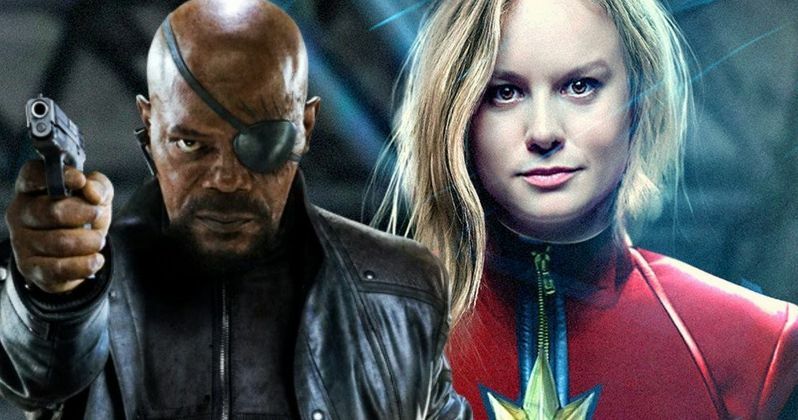 Rumors sprung up over the past week that Samuel L. Jackson will be returning as Nick Fury for Captain Marvel and now Deadline is reporting that it is indeed official. But that's about as far as the news goes regarding Nick Fury's involvement in the upcoming movie, so we're not sure at this time just how big the role will be, but this is exciting news nonetheless. Marvel has yet to confirm the news, but official word is expected soon, perhaps at the upcoming San Diego Comic-Con. Academy Award-winning actress Brie Larson was announced as Captain Marvel at last year's San Diego Comic-Con, which was also a rumor that had been swirling for months. The actress had a lot to consider when signing on to take the role and was initially skeptical to take part in something so large and time consuming, but ultimately chose to take the role. The role ended up being something that was everything that Larson cared about, trying to make something that is progressive, important, and meaningful. Something she says that she wished having when she grew up. And of course the DCEU got the head start on the female-lead superhero movie and now the stakes are even higher for Marvel and their Captain. Wonder Woman has been the hit that DCEU needed at just the right time, now the highest grossing movie that they have had so far. Captain Marvel is already lesser known than Wonder Woman, and now more so than ever, so it will be interesting to see where Marvel and Brie Larson steer that ship. Adding Nick Fury is definitely a good maneuver. Captain Marvel is also rumored to make an appearance in Avengers: Infinity War and possibly the untitled sequel, which should help to introduce the character, much like Wonder Woman in Batman v Superman. Captain Marvel will be an origin story, which is expected to start production in February of 2018 with a release date set for March 8th, 2019. Nicole Perlman and Meg LeFauve are writing the movie and the pair Anna Boden and Ryan Fleck, who directed the acclaimed Sugar in 2008, are set to direct the movie. Until then, we'll have to wait and see Samuel L. Jackson and possibly Brie Larson in Avengers: Infinity War, because we're definitely not going to see Nick Fury in Black Panther, much to the disappointment of Jackson.